Anyway, though I’ve been getting better at remembering to take pictures of my crafts before I send them on their merry ways, there are still many, many handmade items that I don’t have pictures of. Maybe someday I’ll be able to post about the sweater I made for my mom, the layered skirt I sewed for my sister, the strange little nesting chicken I crocheted… But today I’m posting about an item I made just yesterday – a little horse ornament for a swap partner many miles away. 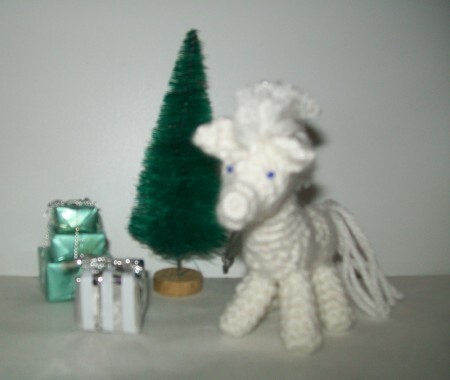 I had joined a swap for handmade ornaments, and my partner wanted either a white or gray horse, a deer, or a nativity scene. The first thing that came to mind was the little horse appliqué on the tractor afghan I made for my nephew. However, I decided to search for other, more three-dimensional characters. I found quite a few, but this little guy from Kristieskids won out (scroll to about the middle of the page for the horse pattern). Mine turned out a bit longer and thinner, even though I was using a smaller crochet hook, but I think he’s pretty dang cute. I wasn’t sure about the colors, so I left the saddle and halter out, but I did give him some eyes made of blue seed beads. I added a silver ribbon for hanging, and sent him on his journey to the UK. 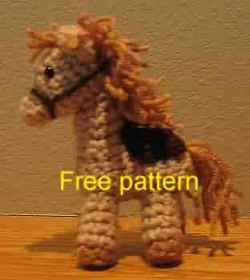 This little amigurumi horse pattern could be used for several different things. He could probably be made into a deer if given some crocheted antlers. He sort of looks like a My Little Pony pony, as well – just stitch on a little emblem on his behind and give him a name!